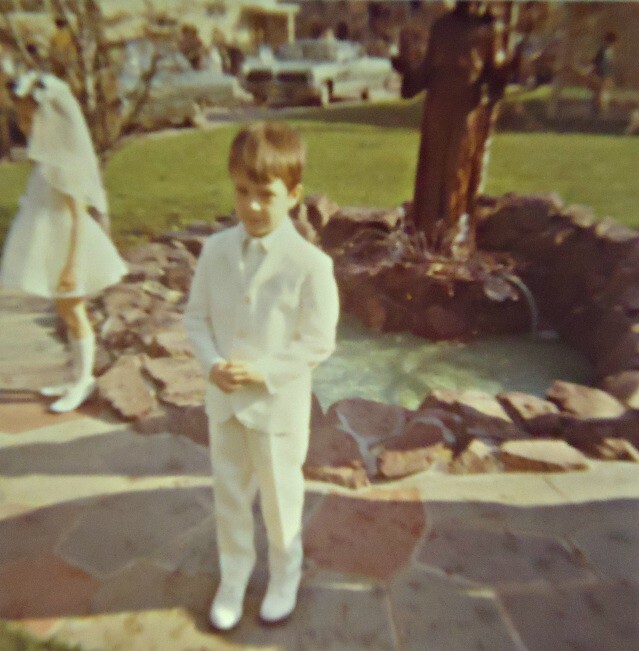 My son received his First Communion this past weekend, and in my judgement, rocked the white suit. It used to be that many young boys receiving the sacrament wore white, but that has changed. Some churches you’ll see communicants in blue suits, blue blazers and khakis and the choices go on. Our church didn’t have any specific requirement, so we asked Julian what he wanted to wear. He didn’t want white, at first anyway, but his view started to change after a recent trip to my hometown of Norwood, Massachusetts to visit my mom. We were walking along Washington Street on the way to lunch when we passed a store that has been a fixture in this Boston suburb since I was a child: Brenner’s. It’s a mom and pop shop in “uptown” or “Norwood Center” where my mother bought my First Communion suit and other items of clothing for my brother and me and one of the reasons this town is a special place. As we looked into the store, we noticed a girl’s white dress in the display window and a matching boy’s suit behind it. We saw it as a sign that Julian should wear traditional white, and we should buy it at Brenner’s, just like his Nana did. 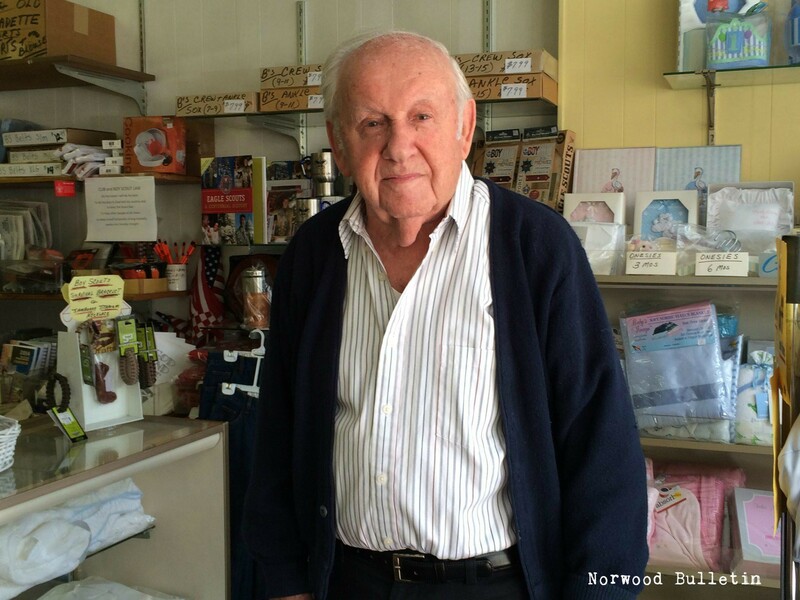 Inside the store was the same couple who’ve owned it for years, Martha and Aron Greenfield. I hadn’t been in the store in decades, and the no-frills store is pretty much unchanged. We were instantly helped by Mr. Greenfield who has a remarkable story to tell. He is a Holocaust survivor. Mr. Greenfield was extremely patient as he helped my son try on a suit my boy was not in any way interested in wearing. The size was perfect: the shirt, pants, jacket and vest. White tie included, and Mr. Greenfield offered us a discount. Deal. My son grimaced a little. 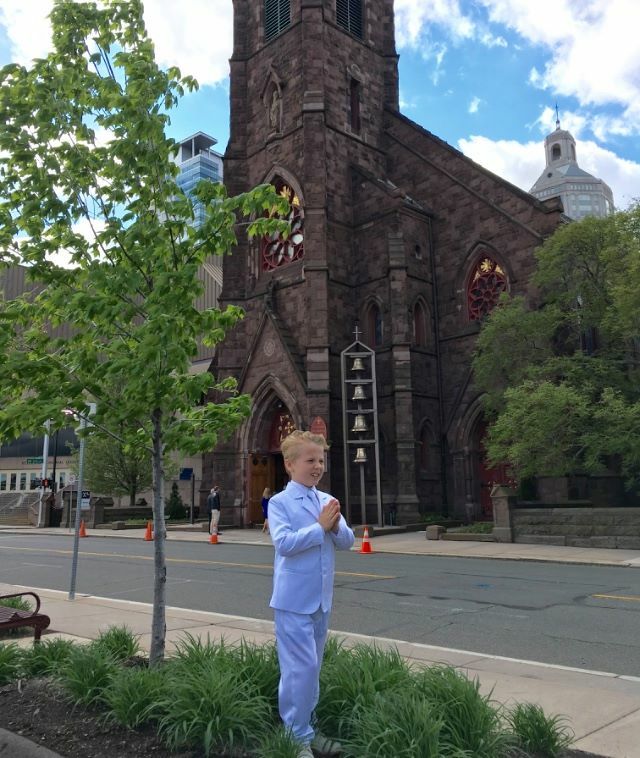 Kara and I told him the only time in his life he’ll have to wear an all white suit is First Communion, unless he’s cast in a remake of Fantasy Island or becomes Colonel Sanders when he grows up. During his free time away from the store, Mr. Greenfield educates children about the horrors of the Holocaust. He survived nine concentration camps. His parents, three brothers and two sisters did not. He travels to schools in suburban Boston and tells others about his experience so this dark chapter in history will never be forgetton. At 90, Mr. Greenfield still puts 100 percent into Brenner’s and shows no signs of retiring. I’m not sure about the future of the store long term, but as a fourth-generation Norwoodite, I’m glad it was part of my life, and my son’s too. Oh, and Julian and the suit? He came around and loved wearing it. After lunch and Brenner’s we bowled at the Norwood Sports Center that’s been around since the 1940s and later Kara and I met a friend at Lewis’ Bar and Grille, which opened in the 1930s. That’s my town. Great article Dennis, thank you. Dennis- I tapped the picture and Julian’s suit turned blue ?????? He looks so handsome ! Just before reading your blog post on Facebook yesterday I read the transcript from 60 Minutes about Benjamin Ferencz, the Nuremberg prosecutor. Thank you for sharing your experience with us. Your son looks so handsome.